The Children's BBC Newsround website provides ready to use "lesson plans" to help teachers use news in the classroom. According to the site: "The lesson plans are designed to be printed off and used in the classroom. They contain background information so you can teach them straight away... All our activities are referenced to the UK's curricula and guidance notes." The site is also part of the National Grid for Learning (a government sponsored strategy to help teachers in the UK by providing educational resources on the internet for use in the classroom). The section on Citizenship (11-14/KS3/Levels E&F), designed for 11-14 years olds, contains lessons in Conflict Resolution. One of the conflicts featured in the "Arab-Israeli conflict". As part of this lesson they provide a 10 page (including quiz) "explanation of the conflict for use at Key Stage 3". Also described as a "Guide to the Middle East" these 10 pages are referenced from other areas of the website where ever a background primer to the conflict is useful. The Conflict Resolution/ Arab-Israeli conflict page would itself make an interesting case study seeing that it features a Palestinian and an Israeli representing the two sides of conflict and then also chooses to feature another Israeli as the non-violent resolver of the conflict! But for this case study we choose to confine our investigation to the 10 page Guide to the Middle East Conflict. We present an image of each page with the url on the left, and on the right we dissect the page, our comments in red expose the pro-Israel bias and on occasions provide additional relevant information. 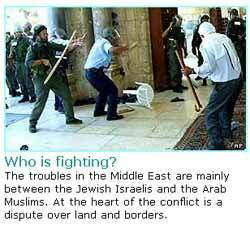 The troubles in the Middle East are mainly between the Jewish Israelis and the Arab Muslims. At the heart of the conflict is a dispute over land and borders. This is a very seeping statement that makes no reference to Palestinians or Palestine, and indeed casts the conflict in racial and religious terms. Christian Palestinians number 6.7% of the Palestinian population and the UN frames this conflict as one relating to the dispossession of Palestinians, the illegal occupation of Palestinian land by the Israelis and the right to return of some 5 million Palestinian refugees. Other issues include the operation of racial discrimination by Israelis against Palestinians, often referred to Israeli apartheid. The simple answer is land. The Palestinians want to have an independent state. There is no mention of occupation. The Palestinian struggle isn't for independence but rather liberation from illegal occupation. But the Israelis are worried that if they control less land Israel won't be safe enough for them to live in. There are many Israeli arguments against a Palestinian state. Some Israelis want to see a greater Israel that extends across the Middle East. Others argue that they have a right to the land and have priority over its inhabitants because of the status given to them in the bible. These two arguments are often used to justify the building of settlements by Israelis in the occupied territories. These settlements are still being built despite being illegal under international law. Although some Israelis argue they need more land for security, the Israeli defence forces are in fact one of the largest in the world, whereas Palestinians do not have any defence forces except a new police service. The main areas they're fighting over are generally known as the West Bank and the Gaza Strip. It's mostly Palestinians who live there, and they want to have full control over them. But the Israelis and Palestinians can't agree on how much land each of them should have, and how any changes in ownership should happen. This portrays the occupied West bank & occupied Gaza as disputed territories, when in fact they are illegally occupied under international law. The UN and indeed the whole world including Britain recognises the whole of the West Bank and Gaza as being illegally occupied by Israel. Instead it mentions “change in ownership” thereby suggesting Israeli ownership of the territories – this legitimacy Israel does not enjoy under international law. In biblical times, the Jewish Israelis lived on the land. But it then came under Arab rule in 800 AD, and many Jews were forced to leave. It starts history from Jews living in Palestine thereby establishing their ownership. If this argument is used then it is inaccurate as the Canaanite's, whom the Palestinians descend from, lived in Palestine before the Jewish immigration to Palestine. In reality in the last 5000 years many civilizations have ruled Palestine including Canaanite's, Philistines, Jews, Egyptians, Assyrians, Persians, Romans, Mongols and Arabs. Out of this whole period up to 1948 Jewish rule over the whole of Palestine has lasted less than a 100 years, and that was 3000 years ago. It also wrongly insinuates that the Arabs forced the Jews out of Palestine. In fact the Romans had expelled the Jews some 500 years before. Another factual error is that the second Caliph entered Jerusalem in 638 AD not 800 AD. The Jews still considered this historic area their 'homeland', and in the early years of the twentieth century thousands starting moving back. After the Second World War, when Jews were treated terribly by Hitler's Nazis, there was more support for creating a country for them to live in. In 1947, the United Nations voted to divide Palestine into two states: Arab and Jewish. The Jews accepted the plan and declared independence for Israel on 14 May 1948. This is untrue. The UN proposed a division. Israeli leaders then unilaterally declared independence (UDI) which is unacceptable under international law, as it does not have international sanction. But the Arabs rejected it, saying it was unfair they didn't get as much land, even though there were more of them. In 1917 when the British occupied Palestine 90% of the population of Palestine was Arab, and they owned 97.5% of the land. Yet the UN partition plan gave 54% of the land to the Jews who by 1947 had only managed, with British help, to acquire 6% of the land. Who are the suicide bombers? A suicide bomber is someone who carries explosives and then kills themselves and other people in a crowded place. There appears to be no shortage of Palestinian recruits ready to die for their cause. Typically, they're unmarried men in their late teens and 20s - but young women have also been sacrificing their lives. The bombers believe that they will go straight to paradise, where they will get places of honour next to God. A whole page has been dedicated to the subject of “suicide bombers”. However if they are going to mention it then must explain why. Palestinians are denied any weapons whilst Israel continues with impunity to use fighter planes, tanks and missiles against the Palestinians. In desperation the Palestinians have been reduced to using their own bodies as a delivery system for explosives. In 2001 the Israeli government decided to build a barrier in the West Bank. Here's what some people think about it. The word “barrier” shows bias because a barrier protects against something and hence supports the Zionist propaganda. A neutral word would be “wall”. The photo accompanying the article shows a road and what appears to be a three foot fence next to it! The photo (below) showing the high wall and watch tower would be more educational. The apartheid wall is 8 metres high and will be at least 350km long. It will include electric fences, trenches, cameras, sensors, and security patrols transforming the West Bank in to a series of concentration camps. Some Palestinians argue that the barrier is unfair as it splits up villages and separates farmers from their land. They are also very worried as it cuts into land they hope will form a future state of Palestine. They fear that they will now never get control of land inside the barrier. Why only “Some” Palestinians? 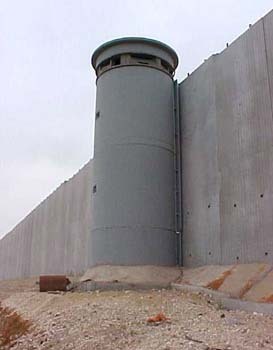 This leaves a false suggestion in the air that some Palestinians support the wall. They are purposely vague in pointing out that the wall is being built on Palestinian land. Are they afraid that even a child will understand that if you wish to keep the neighbours out then you build the wall on your side of the fence, but if you wish to build a prison then you build the wall around those you wish to cage? They say it will prevent Palestinian suicide bombers getting into Israeli cities and it's just a temporary measure to protect Israelis. Officials say it can be dismantled once a permanent peace agreement is reached. Like the Palestinians, some settlers are worried that the barrier is really the new 'border' of Israel. They're worried that their settlements are on the wrong side. Other settlers support its construction for the extra safety it offers. Hopefully children will question the logic of a barrier that is claimed for “protecting Israelis” by leaving them “on the wrong side”! The British and American governments have told Israel that they are against the barrier. The US government reduced the money it lends Israel by $9 billion because of the barrier. The General Assembly of the United Nations said it opposes the barrier. They don't mention why everyone is against it. No mention of turning the West Bank in to a series of concentration camps. No mention that the Palestinian areas encapsulated by the wall amount to just 45% of the West Bank, leaving the rest of the West Bank - fertile land full of olive groves, farms, vegetable fields and water resources -annexed away from the Palestinians, primed for further zionist colonisation. Who are the main leaders? Ahmed Qurei is the new leader of the Palestinian cabinet. The first Palestinian prime minister, Mahmoud Abbas resigned after only 100 days. Ariel Sharon is Israel's Prime Minister. 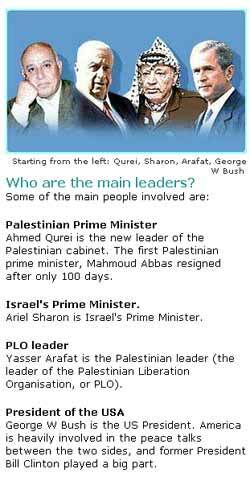 Yasser Arafat is the Palestinian leader (the leader of the Palestinian Liberation Organisation, or PLO). George W Bush is the US President. America is heavily involved in the peace talks between the two sides, and former President Bill Clinton played a big part. Describing Bush as being “involved in the peace talks” is misleading. It should mention that the US is Israel's main ally in the world giving it billions of dollars every year, arming it to the teeth with the most destructive weapons, and protecting it from the worlds condemnation by vetoing every single UN resolution against Israel. Then children can make up their own minds as to whether the US is really an honest peace broker between the two sides. How many wars have there been? There was a huge battle the day after the declaration in 1948, which created more than one million Arab and Israeli refugees. This statement suggests that both Arabs and Israelis were, in the aftermath of the 1948 war, equally displaced and totaled a million between the two sides. This is an outrageous misrepresentation. Before the war, in 1947 the zionists had managed to acquire only 6% of the land. The 1948 war was a war of expansion, a land grab in which the zionists took 77% of historic Palestine, depopulating and destroying 531 (50%) Palestinian villages, and ethnically cleaning 80% of the Palestinian population thereby creating what has become the largest refugee population in the world. 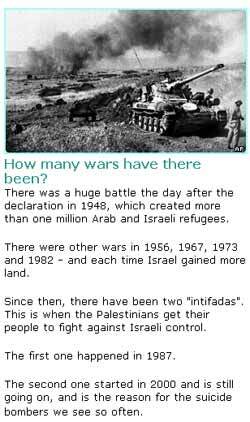 There were other wars in 1956, 1967, 1973 and 1982 - and each time Israel gained more land. To disguise invasions with the word "wars" is misleading. Israel is the only country that has no defined borders, and when in 1953 its first Prime Minister Ben Gurion was asked about this he replied "Where ever the Sahal (israeli army) goes, this is our border.” Staying true to this, Israel has in these "wars" invaded every single country that it shares a border with and annexed their territory to that of Israels. In 1956 it invaded Egypt, in 1967 it invaded Syria, Jordan and Egypt annexing their territory, in 1973 Egypt and Syria tried to regain there occupied lands, and in 1982 Israel again invaded its neighbour, this time Lebanon occupying the south for 18 years until the Hizbullah victory in May 2000. Since then, there have been two "intifadas". This is when the Palestinians get their people to fight against Israeli control. How can you mention the intifada with out once having referred to the occupation? The intifada is legitimate resistance to occupation as sanctioned in the United Nations charter. Without placing it in its proper frame of reference the intifada is misrepresented as some sort of aggression initiated by the Palestinians. The first one happened in 1987. The second one started in 2000 and is still going on, and is the reason for the suicide bombers we see so often. The intifada isn't the reason for the suicide bombers – the 56 years of occupation and oppression is the reason. Has there ever been any progress to peace? Yes. 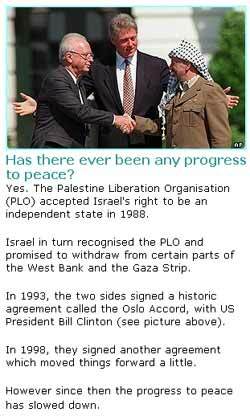 The Palestine Liberation Organisation (PLO) accepted Israel's right to be an independent state in 1988. Israel in turn recognised the PLO and promised to withdraw from certain parts of the West Bank and the Gaza Strip. In 1993, the two sides signed a historic agreement called the Oslo Accord, with US President Bill Clinton (see picture above). In 1998, they signed another agreement which moved things forward a little. However since then the progress to peace has slowed down. With out any recognition that the two sides are not equal – that one is an oppressor, and the other oppressed, that one according to the UN is an occupier of the others land, this section looses meaning. How can the reader be expected to judge what a just peace is if they are denied these basic facts? Without the facts, deceptive statements like “the PLO accepted Israel… and it turn Israel recognised the PLO” seem on equal footing whilst in reality recognition of Israel meant the PLO was giving up claim to 54% of Palestinian land. Israel, on the other hand, lost nothing by recognising the PLO and in fact gained huge cash rewards from the US. Promises of withdrawal were lies and till today Israel still occupies the West Bank and Gaza with more colonial “settlements” being built by each successive Israeli government. Peace agreements which do not address the issue of justice have proved to be nothing more that a way for Israel to legitimise and legalise its theft of Palestinian land. So having "given up" 54% of Palestinian land in 1988 with out anything in return, the "peace agreements" of 1993 and 1998 concentrated on how much more of of the little remaining land Arafat was prepared to sign away. A new set of peace talks broke down in summer 2000 because the Israelis and Arabs could not agree on the future of Jerusalem - which both sides claim is their own capital. International law is clear that territory taken in war, like Israel's occupation of Jerusalem, must be returned. Why is there no mention that the world including Britain rejects Israel's claim to Jerusalem as its capital because it breaks international law governing the rights and obligations of an occupying power. Since then, violence has got worse again. There have been agreements to continue peace talks, but both sides don't like what the other is doing. In April 2003, international diplomats from the European Union, Russia, the United Nations and the US handed over what's called the "roadmap to peace". This is a massive plan set out in stages which hopes to solve the arguments over land and other issues which has caused so much violence. The plan hopes a full and official Palestinian state will be set up - possibly by 2005. Taking apart of Jewish settlements built since 2001. Q3: What city does Israel call its capital? 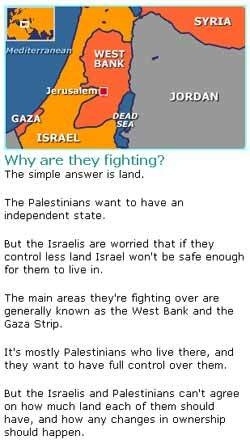 This question, especially in the careful way it is worded, reveals a zionist propagandist agenda. Jerusalem is NOT the capital of Israel. Jerusalem was taken in a war and as such under international law is occupied territory that can never become the capital of the occupying power. That is why no country in the world recognises Jerusalem as Israel's capital. All this is maliciously hidden from the reader, who is left to accept Israel's claim of Jerusalem as its capital. Q4: What are the main areas which the Israelis and Palestinians are fighting over? Vague words like "fighting over" suggest the question of ownership is in dispute - this is not true. According to the United Nations, the West Bank and Gaza Strip are illegally occupied by Israel and under international law it must vacate those territories. There is no mention of the racism at the ideological heart of the Israeli state- Zionism. With arm twisting the US may have managed to over turn the 1975 UN resolution exposing Zionism as "a form of racism", but the fact remain that Israel is an apartheid state. Non-Jews are routinely discriminated under the law. Recently its racists marriage laws hit the headlines and were condemned by the international community. There is no mention that Israel is illegally occupying the West Bank and Gaza. There is no mention of the systematic violence being carried out by the Israeli army against the Palestinian population. Human right groups and the UN have repeatedly condemned it, but Israel continues with impunity. There is no mention of the Right of Return for the 5 million Palestinian refugees that Israel is denying in breach of international law. There is no mention of the total contempt Israel has for UN resolutions. There are more UN resolutions against Israel than any other country in the world. Knowledge and understanding about becoming informed citizens. Clearly this "Guide to the Middle East Conflict" fails to satisfy these curriculum requirements. In order to resolve conflict FAIRLY both sides of the conflict must be portrayed fairly and judged according to international norms such as international law, United Nations resolutions, and human rights. The 10 page guide fails to even mention once that the West Bank and Gaza are according to international law illegally occupied by Israel. How can such deception possibly help young children become informed citizens? Since our investigation, Children's BBC website has been updated. Unfortunately the changes and new additions still reflect the same dishonesty and bias as those pages we have featured in our case-study. As an exercise we ask you to look at two of the new pages added to the site: Who are the Israelis? and Who are the Palestinians? (reproduced below) and compare and contrast how the Israelis are described to how the Palestinians are described, and consider how that influences a child reading these pages. Israelis are people who live in Israel, which is at the eastern end of the Mediterranean Sea. Israel began as a homeland for Jewish people. In the early part of the 20th century thousands of Jews moved to the area before it became Israel to start new lives and set up new communities. Jews have long historical and religious ties to the land dating back thousands of years, but the country itself was only created in 1948. Many were escaping Europe and Russia as they were badly treated there because they were Jewish. Many more moved to Israel after the Holocaust. Palestinians do not have a country to call their own. They trace their roots to the land that is now called Israel, the West Bank and the Gaza Strip. The majority of Palestinians are Muslims, but quite a few are Christian. In the 1960s many Palestinians grew frustrated at not having a state to call their own. They formed lots of groups, the largest of which is known as the PLO - the Palestinian Liberation Organisation. For several decades the PLO, and other armed groups, carried out lots of violent attacks against Israelis and Jewish people. One group killed 11 Israeli athletes at the Olympic games in 1972. Other groups hijacked airplanes and boats. In 1987 Palestinians living in the West Bank and the Gaza Strip began fighting against Israeli soldiers and settlers in what was called the Intifada, or uprising. Many children demonstrated against Israeli soldiers and settlers. In the 1990s the PLO agreed to stop attacks against Israelis and the Intifada ended. In the description, the Israelis are defined in terms of a place - Israel -this automatically bestows on them a sense of belonging, of ownership. In contrast there is not even one reference to Palestine in the description of the Palestinians. Their description denies them a home by hiding the fact that they do indeed have a home - its called Palestine - but that it was taken from them and destroyed to create Israel. What effect does this omission have on a child's perception as to the rightful ownership of the land? There are at least 7 other points to consider which we leave for you to do. We suggest this case study of pro-Israel bias in a leading "educational" website be used to form the basis of a lesson to be taught at schools, and Madressa's, and by parents to their children at home. The best way to teach your children about the pro-zionist bias around them is to show them an example, one which they can understand and relate to because it targets them. The feature is a biased and prejudiced portrayal of Middle Eastern issues and IHRC is deeply concerned that such a sub-standard piece of journalism had been produced and put forward on a children’s news site. 1. This feature is contains ideological aspects as well as prejudice and bias in favour of one party over another. “The troubles in the Middle East are mainly between the Jewish Israelis and the Arab Muslims.” This is incorrect as many Palestinians are in fact Christian, many profess to be secular and fighting under the banner of other ideologies, and many Jews support the Palestinian cause. The issue of Israeli racism is never mentioned in this feature. 3. It characterise the conflict as “a dispute over land and borders.” This suggests that parties in this matter are struggling from an equal situation when in fact one party, according to the United Nations is in fact illegally occupying the land of another. Infact nowhere is the phrase ‘illegal occupation’ which is a matter of fact, used. 4. The issue of the right of return for the over 5 million Palestinian refugees is never mentioned as an issue. Indeed the only reference to refugees misleadingly suggests that both Arabs and Israelis were, in the aftermath of the 1948 war, equally displaced and totalled a million between the two sides. This is an outrageous misrepresentation . If you are reusing this alert, please cite the source (www.ihrc.org).